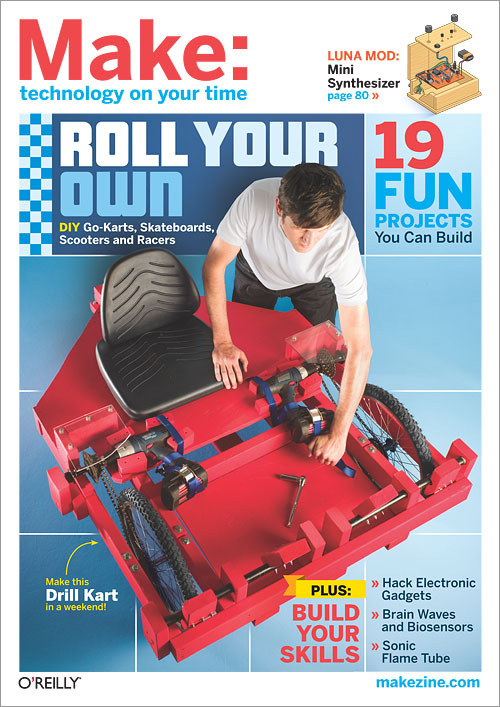 MAKE Volume 26: Karts & Wheels Garage go-kart building is a time-honored hobby for do-it-yourselfers, and we'll show you how to build wheeled wonders that’ll have you and the kids racing around the neighborhood in DIY style. Build a longboard skateboard by bending plywood. Build a crazy go-kart driven by a pair of battery-powered drills. Put a mini gasoline engine on a bicycle. And construct an amazing wind-powered cart that can outrun a tailwind. Plus you’ll learn how to build the winning vehicle from our online Karts and Wheels contest!